Same problem. Mummy bandages don't show on the wings but everything else fixed itself after clearing cache. All my costumes (even ghost now) disappeared. Unfortunately, nothing helps. Ok, a hard refresh seems to have fixed my issues, but I have a question. Is there only 1 pirate hat - black, and only 1 pirate eyepatch - navy? All the other costumes have all pieces complete in each costume so I was wondering if this is intentional or a continuing of the same problem we seem to be having. But there's only one eye patch and only one cutlass. Oh and yes, only one pirate hat. Thanks Fuzz. Since I dressed mine in red I didn't even notice the one cutlass. So, 1 pirate hat, 1 pirate eyepatch, 1 cutlass. Nice to know. Thanks again. I haven't been able to see Mummy Wings all day. the rest came back with a hard refresh. I also see no mummy wings. For me, clearing the cache worked for all but the Mummy's Wings. Mine isn't showing y p either! And I have the green wizard outfit and the navy pirate but I didn't buy those. Plus, I have Mummy popping up in my store. I only saw pirate last night. Are we not supposed to have the mummy yet? We do seem to get a free outfit every day - and as I recall, those were the two I got by doing nothing. When I logged on this morning tons of costume stuff was missing, but I read this thread and did a hard refresh and everything came back... Except the mummy wings. The mummy wings are missing and nothing I've done (another hard refresh, clearing cookies, etc) has fixed it. Most of my costumes are missing. And the pirate hat had somehow been replaced with a green wizard hat? After a hard refresh, Hufflepuff items are now visible for me, but mummy wings are still not there. I wasn't really going to use them, but I'd like to see what they look like! Sorry, right after I posted, they popped up. I'm on mobile and can't see most of the outfits, and the green wizard outfit (which I already own) is shown as the black pirate outfit. I'm having the same issue. I bought the navy pirate outfit and put on the free (black) one, and they were working last night. Now it's turned into the Slytherin costume and I don't even own that! I've been doing a hard refresh & today's pirate costume hasn't shown all day for me. 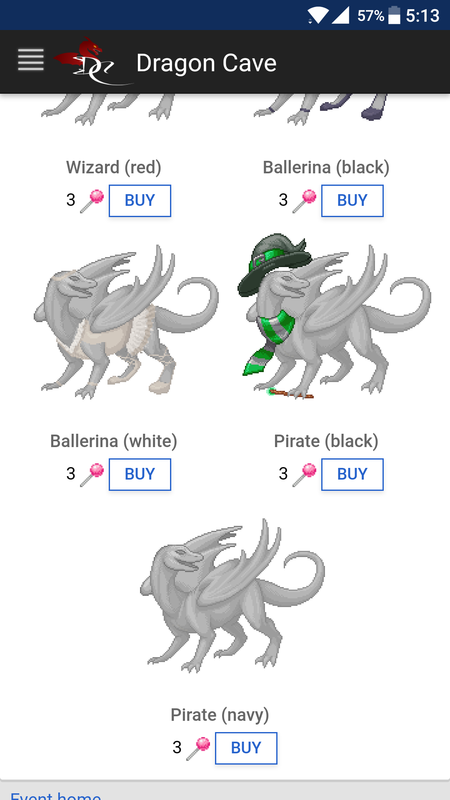 Even the hatchies that I'm assuming are wearing it are turning up naked on my list of who I gave candy to. On the dress up page I can see that there are new items to try, but the little dragon models are naked. The red pirate outfit isn't showing up for me even after a hard refresh (a hard refresh is fn+f5, isn't it? i might be forgetting).